I thought you might like to see this. 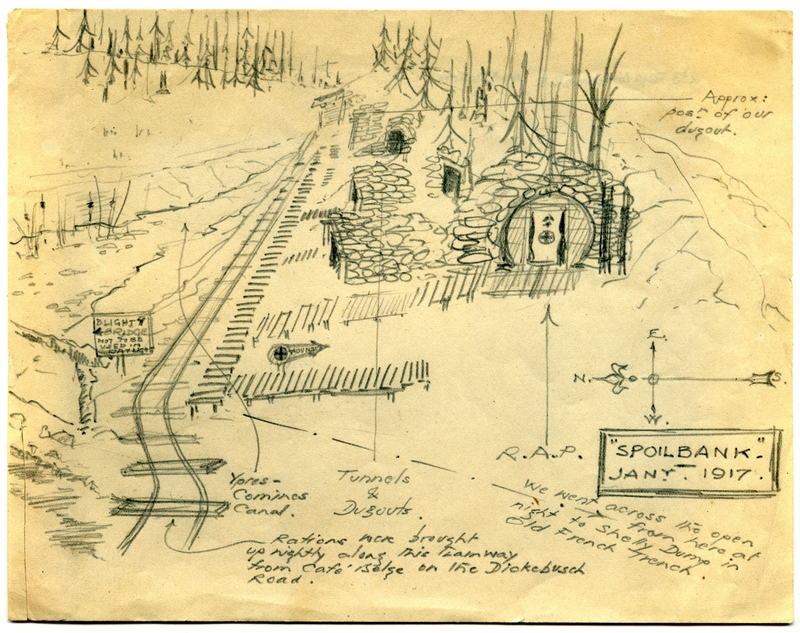 Drawn by Lieutenant (and later Captain) H. M. Boyd, Royal Engineers, and kindly lent to me for use on this site by a member of his family (who naturally holds the copyright), it shows the area referred to as “Spoilbank” early in 1917. 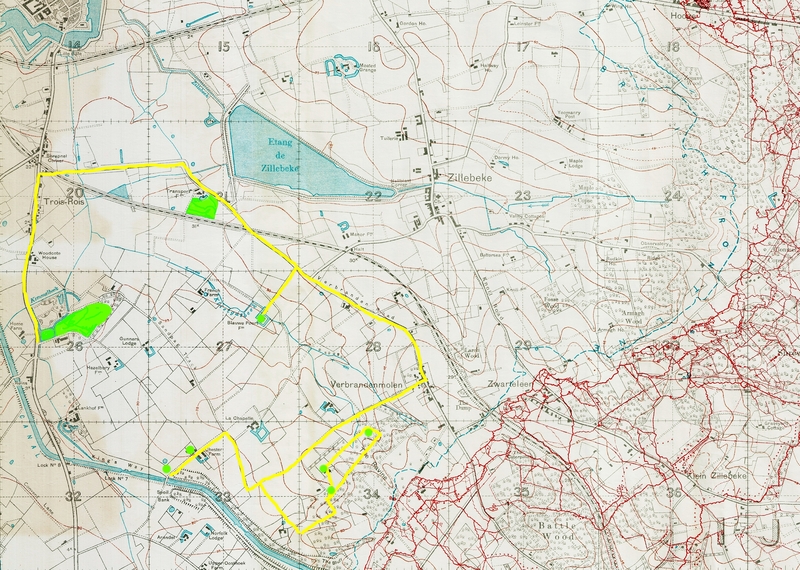 Take a look at this trench map which shows the route of the first part of our Zillebeke tour. Down near the bottom left hand corner you can see “Spoilbank” clearly marked, just south of the Ypres-Comines Canal, with the green dot signifying Spoilbank Cemetery, directly opposite on the northern side of the canal. You can even see “Blighty Bridge”, as Captain Boyd refers to it in the sketch, crossing the canal if you look carefully. “Not to be used in daylight”. Indeed not. This entry was posted in Documents & Artwork, Zillebeke. Bookmark the permalink. What does it mean “R.A.P.” (just close to the Spoilbank sign)? Pardon my ignorance! HAVE BEEN INVOLVED IN THE EVENTUAL CONSTRUCTION WORK. FULL OF INTEREST, AND ATMOSPHERE. GOOD TO SEE. THANKS, ARTHUR. My late father was in the Australian 16th Battalion and was at Spoilbank, as he recalls the date was February or March 1917 which would be the period for this wonderful sketch. He helped bring down a German plane with Lewis Gun then he ripped a piece of camouflaged canvas off the wing for a souvenir. He gave this piece to me in November 1976 and I still have it as a precious piece of memorabillia. I would be very pleased to hear if anyone has information of this 1917 event? Most interesting Sid, and what a fascinating piece of memorabilia to own. While we are talking, and even though I am on the other side of the world to you, I know you Mr Breedon! We met last summer. And if you can’t work out who I am, I might tell you next week after I return from a long weekend about to be spent in Flanders fields. I might even be driving right past Spoilbank in just a few days time, and I will certainly be within a mile of it! Funny old world. Right first time Sid. And how I could possibly have included you with those Breedons is beyond me (note to self: sloppy work. Must do better next time). I’d be most interested to hear about your father’s Somme experiences one of these days. Anyway, must get packing……literally. In due course MS let me know your email address to send a description of the wounding at Sailly Laurent followed by the long period of repair, recuperation and repatriation. Also the lead up to his volunteering for WW1. Back then it was a “given” for especially Free Colony Western Australian “Colonials” to be partiotic to the Motherland. For day to day living they had a superb attitude and camaraderie eeking out a living during times when it was much harder than most of us these days could ever understand. No roads, only bush tracks. No cars only horse and buggies. Then finally some motor vehicles that could average only seven MPH on the tracks. Remarkable times!